Glad you like the music, Yankopunk. ♫♪ My favorite song to sing is "Because The Night." Is that you singing lead on Because The Night?? Great cover!!!! Yes, that's me! Thanks for the compliment, Jon. The other songs I sing lead on are Message In A Bottle, No Matter What, Adam's Apple, Tush, Stuck In The Middle, Rebel Yell, Before He Cheats, and Goodbye To You. Like I said, these are from practice sessions, so I might mess up a lyric here and there on some of these. I nailed Because The Night, though. From one Patti to another, right? Indeed. I am a Patti who sings one song by a Patti and one by a Patty (Patty Smyth, of Scandal fame). 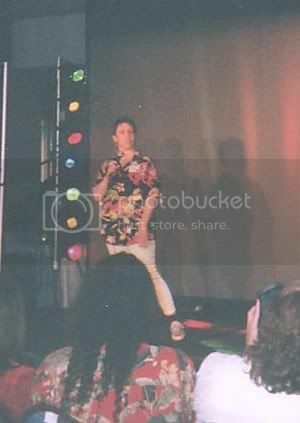 Oh, I can't forget this lame claim to fame, which was doing stand-up comedy at Alcon III in front of Al, Suzanne, and the large crowd of people who came to see the Gong Show. I won 4th prize out of 6. Not bad. I met the Prime Minister today. YankoSwag 8888 wrote: I met the Prime Minister today. How/why?? How did it go? He visited city hall in Victoria today. I saw the governor of NY when I was at a political rally last year. Rick Sloane just wished me a happy birthday on Facebook by posting a Hobgoblins meme (the film he directed in the mid '80s that later got made fun of on MST3K in the late '90s which he has since been mostly super cool about) on my wall.